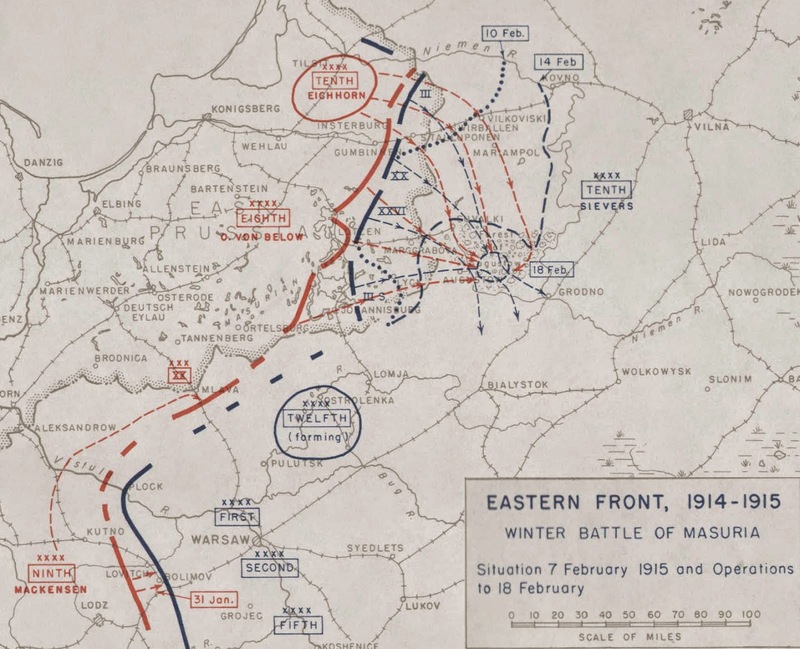 - The Winter Battle of the Masurian Lakes opens today as the German 8th and 10th Armies commence their advance, though the weather is the worst imaginable: a severe blizzard blankets the front, with gale-force winds driving snow into the faces of the German infantry. Though the Germans suffer terribly, the poor weather has the unintended benefit of masking their true strength from the Russians; the entirety of 8th Army is dismissed as being a mere small detachment. The Russians, then, have no idea of the size of the enemy force bearing down on 10th Army. Moreover, the attention of North-West Front is on 12th Army, still assembling to the south of East Prussia and which is to launch a major Russian offensive northwards in mid-February. With their focus to the southwest, the Russian leadership dismisses any notion of a substantial threat to 10th Army, and the latter is strung out and poorly-entrenched. Once again, a Russian army has been left vulnerable to a German attack. An isolated second-line Russian division finds itself in the path of the advance of the German 8th Army, which erroneously believes that the Germans are moving on the fortress of Osowiec to the south. Under German attack, the division disintegrates, and the advance continues. The Winter Battle of the Masurian Lakes, February 7th to 18th, 1915. - For the past two months, Indian Expeditionary Force D has been consolidating its hold on Qurna and the Shatt al-Arab. Little enemy activity has been seen beyond the occasional armed demonstration by Ottomans, regarded as nothing more than nuisances. Over the past three days, Lord Hardinge, Viceroy of India, has been in the region, visiting Basra and touring the front line around Qurna. His presence is meant to reassure nearby wavering Arab tribes that the British are here to stay. As the Viceroy departs today, he is pleased with the balance of forces in the area, and is confident that IEF D does not need substantial reinforcement.